What Are My Rights After Getting Injured at a Construction Site? Home » The Law & You » I Was Injured At a Construction Site as a Temp Employee. What Are My Rights? I Was Injured At a Construction Site as a Temp Employee. What Are My Rights? What are your rights as a temporary employee at a construction site? That’s what one viewer wants to know after getting injured when another worker dropped a pallet on his foot. Construction accident lawyers Greg Fellerman and Ed Ciarimboli answer this question. Dave Kuharchik: A construction site injury. That is the topic for today’s “The Law & You.” Back with us attorneys Greg Fellerman and Ed Ciarimboli. Gentlemen nice to see you. Ed Ciarimboli: Nice to see you. You look like a million bucks today. Dave: You guys as well. Dave: Well, you’re ready to answer questions. Greg Fellerman: We’re ready, not so sure about looking like a million bucks, but we’re ready to answer questions. Ed: This is a very complicated situation because the temp agency you were working for may be the employer in this particular circumstance. It’s really going to depend on the extent of this particular job site, what temps they were using, did the temp agency have an office on site or not. Really some complicated questions there. Ultimately, you got hurt at work and you’ll be entitled to comp; It is just who is ultimately going to pay for that worker’s compensation. Greg: More likely than not the temp company he’s working for would be responsible for his lost wages and his medical. In those situations, let’s say the injury was more significant; We’d have to look at the construction agreements if there’s a third party case. That defines who the players are and what they do. Again, it’s complicated but the good news is there should be workers compensation insurance for you; There may be a third party claim but with the injuries I don’t know if it’s worth it. Stick to comp. Ed: Yeah stick to the comp. Greg: Give us a call. Dave: To do that is very easy, the number is on the screen and so is the web-site. 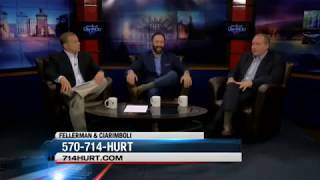 Don’t forget results matter with attorneys Greg Fellerman and Ed Ciarimboli. Greg: You got it. Thank you.